This guide follows the Creating Virtual Machines guide. Once a Template is instantiated to a Virtual Machine, there are a number of operations that can be performed using the onevm command. pend Pending By default a VM starts in the pending state, waiting for a resource to run on. It will stay in this state until the scheduler decides to deploy it, or the user deploys it using the onevm deploy command. hold Hold The owner has held the VM and it will not be scheduled until it is released. It can be, however, deployed manually. prol Prolog The system is transferring the VM files (disk images and the recovery file) to the host in which the virtual machine will be running. boot Boot OpenNebula is waiting for the hypervisor to create the VM. runn Running The VM is running (note that this stage includes the internal virtualized machine booting and shutting down phases). In this state, the virtualization driver will periodically monitor it. migr Migrate The VM is migrating from one resource to another. This can be a life migration or cold migration (the VM is saved, powered-off or powered-off hard and VM files are transferred to the new resource). hotp Hotplug A disk attach/detach, nic attach/detach operation is in process. snap Snapshot A system snapshot is being taken. save Save The system is saving the VM files after a migration, stop or suspend operation. epil Epilog In this phase the system cleans up the Host used to virtualize the VM, and additionally disk images to be saved are copied back to the system datastore. shut Shutdown OpenNebula has sent the VM the shutdown ACPI signal, and is waiting for it to complete the shutdown process. If after a timeout period the VM does not disappear, OpenNebula will assume that the guest OS ignored the ACPI signal and the VM state will be changed to running, instead of done. stop Stopped The VM is stopped. VM state has been saved and it has been transferred back along with the disk images to the system datastore. susp Suspended Same as stopped, but the files are left in the host to later resume the VM there (i.e. there is no need to re-schedule the VM). Same as suspended, but no checkpoint file is generated. Note that the files are left in the host to later boot the VM there. When the VM guest is shutdown, OpenNebula will put the VM in this state. unde Undeployed The VM is shut down. The VM disks are transfered to the system datastore. The VM can be resumed later. fail Failed The VM failed. unkn Unknown The VM couldn’t be reached, it is in an unknown state. done Done The VM is done. VMs in this state won’t be shown with onevm list but are kept in the database for accounting purposes. You can still get their information with the onevm show command. The following sections show the basics of the onevm command with simple usage examples. A complete reference for these commands can be found here. Read the Creating Virtual Machines guide for more information on how to manage and instantiate VM Templates. 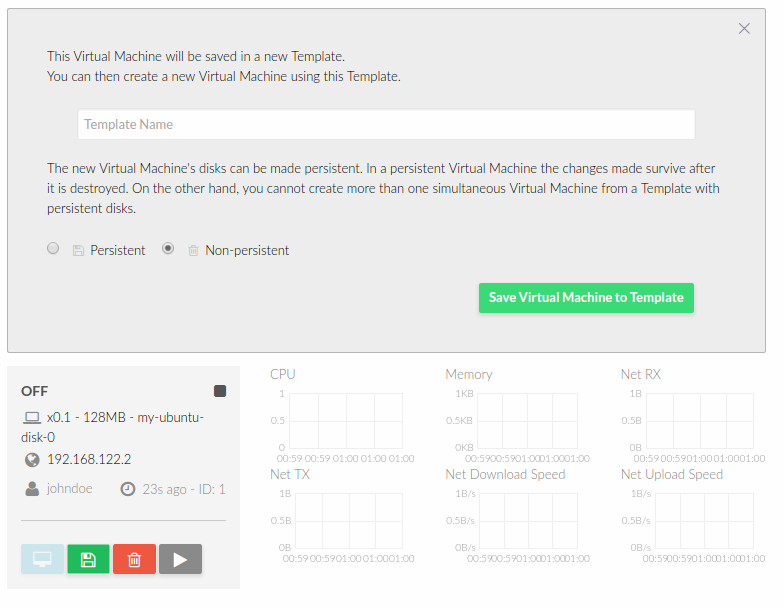 Read the complete reference for Virtual Machine templates. There are some parameters that require user input. Afterwards, the VM can be listed with the onevm list command. You can also use the onevm top command to list VMs continuously. You can search for VM instances by using the --search option of the onevm list command. This is specially usefull on large environments with many VMs. The filter must be in a KEY=VALUE format and will return all the VMs which fit the filter. This feature is only available for MySQL backend with a version higher or equal than 5.6. You can terminate an instance with the onevm terminate command, from any state. It will shutdown (if needed) and delete the VM. This operation will free the resources (images, networks, etc) used by the VM. terminate: Gracefully shuts down and deletes a running VM, sending the ACPI signal. Once the VM is shutdown the host is cleaned, and persistent and deferred-snapshot disk will be moved to the associated datastore. If after a given time the VM is still running (e.g. guest ignoring ACPI signals), OpenNebula will returned the VM to the RUNNING state. terminate --hard: Same as above but the VM is immediately destroyed. Use this action instead of terminate when the VM doesn’t have ACPI support. suspend: the VM state is saved in the running Host. When a suspended VM is resumed, it is immediately deployed in the same Host by restoring its saved state. poweroff: Gracefully powers off a running VM by sending the ACPI signal. It is similar to suspend but without saving the VM state. 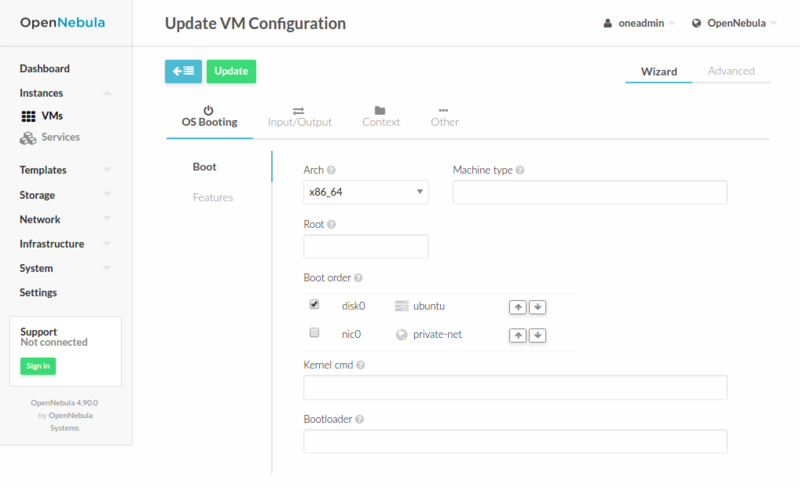 When the VM is resumed it will boot immediately in the same Host. poweroff --hard: Same as above but the VM is immediately powered off. Use this action when the VM doesn’t have ACPI support. When the guest is shutdown from within the VM, OpenNebula will put the VM in the poweroff state. undeploy: Gracefully shuts down a running VM, sending the ACPI signal. The Virtual Machine disks are transferred back to the system datastore. When an undeployed VM is resumed, it is be moved to the pending state, and the scheduler will choose where to re-deploy it. undeploy --hard: Same as above but the running VM is immediately destroyed. stop: Same as undeploy but also the VM state is saved to later resume it. resume: Resumes the execution of VMs in the stopped, suspended, undeployed and poweroff states. reboot: Gracefully reboots a running VM, sending the ACPI signal. reboot --hard: Performs a ‘hard’ reboot. hold: Sets the VM to hold state. The scheduler will not deploy VMs in the hold state. Please note that VMs can be created directly on hold, using ‘onetemplate instantiate –hold’ or ‘onevm create –hold’. disk-snapshot-create, disk-snapshot-revert, disk-snapshot-delete, disk-snapshot-rename: Allows the user to take snapshots of the disk states and return to them during the VM life-cycle. It is also possible to rename or delete snapshots. disk-saveas: Exports VM disk (or a previously created snapshot) to an image. This is a live action. A user can take snapshots of the disk states at any moment in time (if the VM is in RUNNING, POWEROFF or SUSPENDED states). These snapshots are organized in a tree-like structure, meaning that every snapshot has a parent, except for the first snapshot whose parent is -1. At any given time a user can revert the disk state to a previously taken snapshot. The active snapshot, the one the user has last reverted to, or taken, will act as the parent of the next snapshot. In addition, it’s possible to delete snapshots that are not active and that have no children. The default behavior described previously can be overridden by the storage driver; and it may allow a flat snapshot structure without parent/child relationship. In that case, snapshots can be freely removed. disk-snapshot-create <vmid> <diskid> <name>: Creates a new snapshot of the specified disk. disk-snapshot-revert <vmid> <diskid> <snapshot_id>: Reverts to the specified snapshot. The snapshots are immutable, therefore the user can revert to the same snapshot as many times as he wants, the disk will return always to the state of the snapshot at the time it was taken. 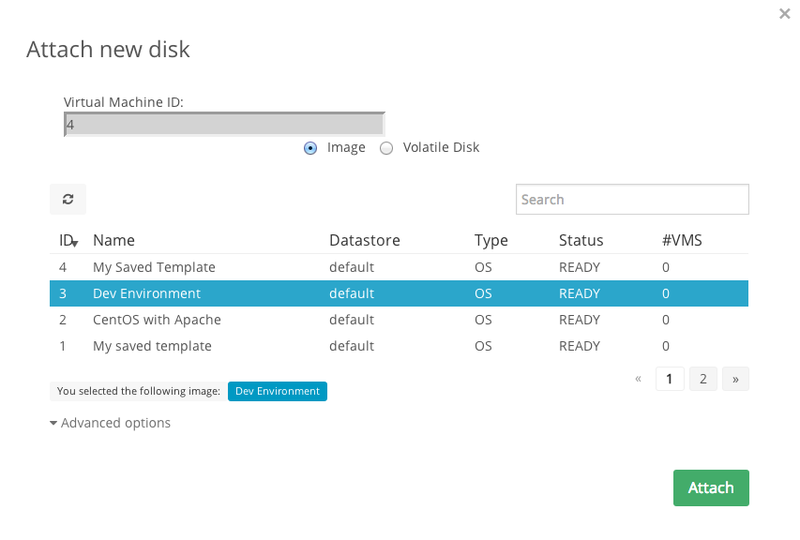 disk-snapshot-delete <vmid> <diskid> <snapshot_id>: Deletes a snapshot if it has no children and is not active. Hypervisor VM_MAD=kvm combined with TM_MAD=qcow2 datastores. 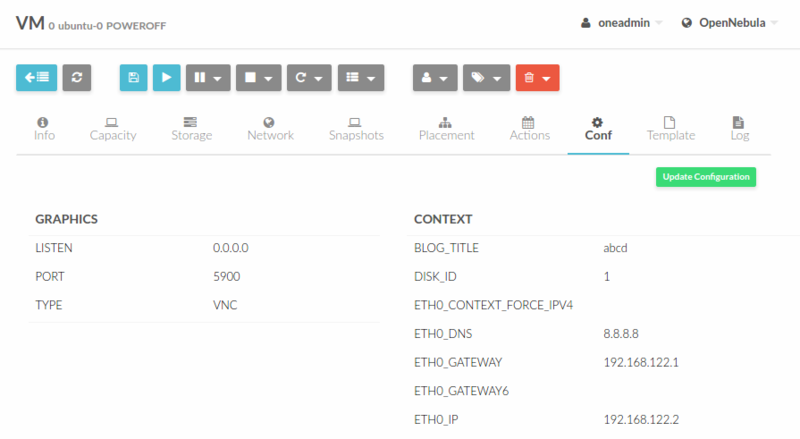 In this case OpenNebula will request that the hypervisor executes virsh snapshot-create. Hypervisor VM_MAD=kvm with Ceph datastores (TM_MAD=ceph). In this case OpenNebula will initially create the snapshots as Ceph snapshots in the current volume. With CEPH and qcow2 datastores and KVM hypervisor you can enable QEMU Guest Agent. With this agent enabled the filesystem will be frozen while the snapshot is being done. OpenNebula will not automatically handle non-live disk-snapshot-create and disk-snapshot-revert operations for VMs in RUNNING if the drivers do not support it. In this case the user needs to suspend or poweroff the VM before creating the snapshot. See the Storage Driver guide for a reference on the driver actions invoked to perform live and non-live snapshost. These actions are available for both persistent and non-persistent images. In the case of persistent images the snapshots will be preserved upon VM termination and will be able to be used by other VMs using that image. See the snapshots section in the Images guide for more information. Depending on the DISK/CACHE attribute the live snapshot may or may not work correctly. To be sure, you can use CACHE=writethrough, although this delivers the slowest performance. Any VM disk can be exported to a new image (if the VM is in RUNNING, POWEROFF or SUSPENDED states). This is a live operation that happens immediately. This operation accepts --snapshot <snapshot_id> as an optional argument, which specifies a disk snapshot to use as the source of the clone, instead of the current disk state (value by default). This action is not in sync with the hypervisor. If the VM is in RUNNING state make sure the disk is unmounted (preferred), synced or quiesced in some way or another before taking the snapshot. In vCenter, the save as operation can only be performed when the VM is in POWEROFF state. Performing this action in a different state won’t work as vCenter cannot unlock the VMDK file. 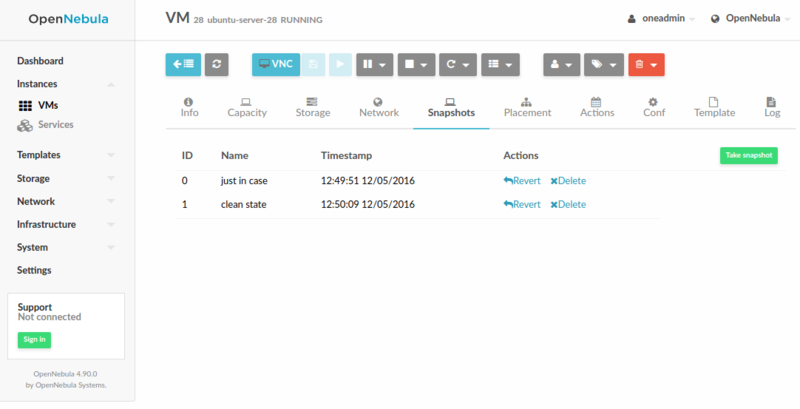 You can create, delete and restore snapshots for running VMs. A snapshot will contain the current disks and memory state. onevm snapshot-create 4 "just in case"
The snapshots are lost if any life-cycle operation is performed, e.g. a suspend, migrate, delete request. Snapshots are only available if all the VM disks use the qcow2 driver. You may resize the capacity assigned to a Virtual Machine in terms of the virtual CPUs, memory and CPU allocated. VM resizing can be done in any of the following states: POWEROFF, UNDEPLOYED. 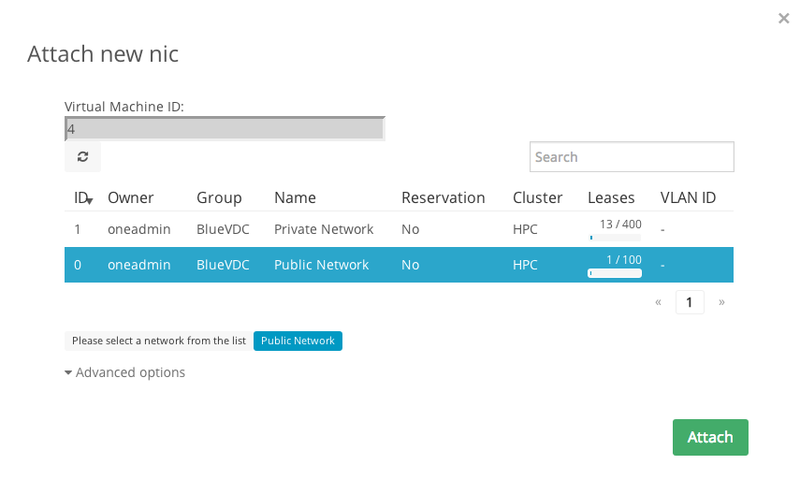 Note that using this procedure the VM will preserve any resource assigned by OpenNebula, such as IP leases. Using the contextualization packages, at boot time the VM will grow the filesystem to adjust to the new size. This is only available for Linux guests in KVM and vCenter. In vCenter a disk can be resized only if the VM is in poweroff state and the VM has no snapshots or the template, which the VM is based on, doesn’t use linked clones. 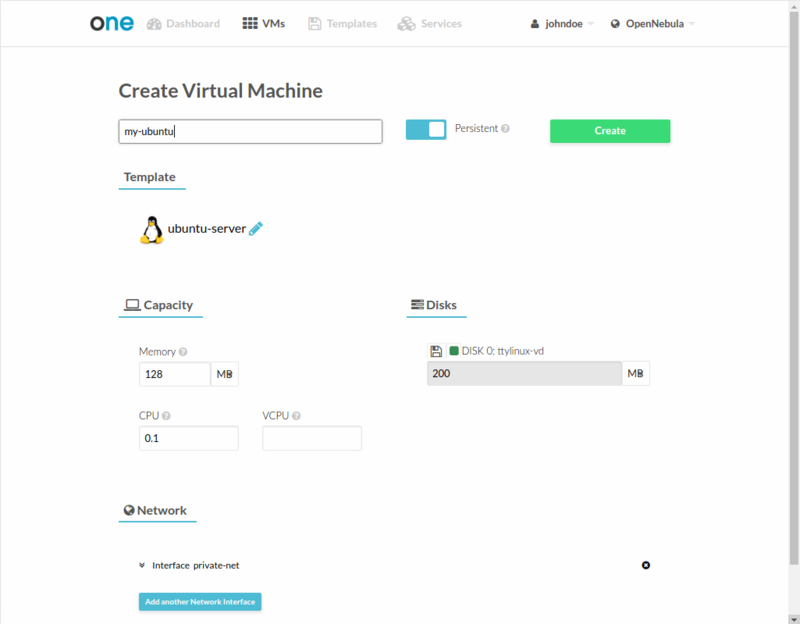 A VM Template or VM instance can be copied to a new VM Template. This copy will preserve the changes made to the VM disks after the instance is terminated. The template is private, and will only be listed to the owner user. When instantiating to persistent the Template is cloned recursively (a private persistent clone of each disk Image is created), and that new Template is instantiated. Volatile disks cannot be persistent, and the contents will be lost when the VM is terminated. The cloned VM Template will contain the definition for an empty volatile disk. Alternatively, a VM that was not created as persistent can be saved before it is destroyed. To do so, the user has to poweroff the VM first and then use the save operation. This action clones the VM source Template, replacing the disks with snapshots of the current disks (see the disk-snapshot action). 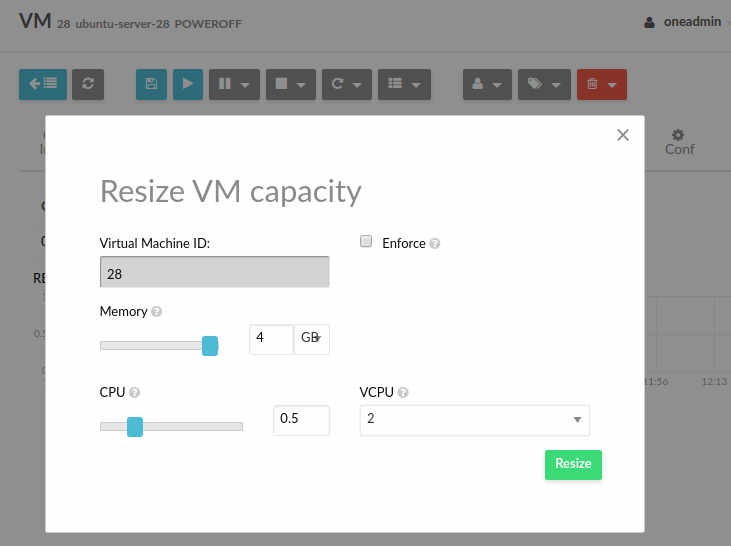 If the VM instance was resized, the current capacity is also used. The new cloned Images can be made persistent with the --persistent option. NIC interfaces are also overwritten with the ones from the VM instance, to preserve any attach/detach action. The VM’s source Template will be used. If this Template was updated since the VM was instantiated, the new contents will be used. Volatile disks cannot be saved, and the current contents will be lost. The cloned VM Template will contain the definition for an empty volatile disk. Disks and NICs will only contain the target Image/Network ID. If your Template requires extra configuration (such as DISK/DEV_PREFIX), you will need to update the new Template. We have two types of schedule actions, punctual and relative actions. Punctual actions can also be periodic. Most of the onevm commands accept the --schedule option, allowing users to delay the actions until the given date and time. onevm suspend 0 --schedule "09/20"
onevm resume 0 --schedule "09/23 14:15"
These actions can be deleted or edited using the onevm update command. The time attributes use Unix time internally. 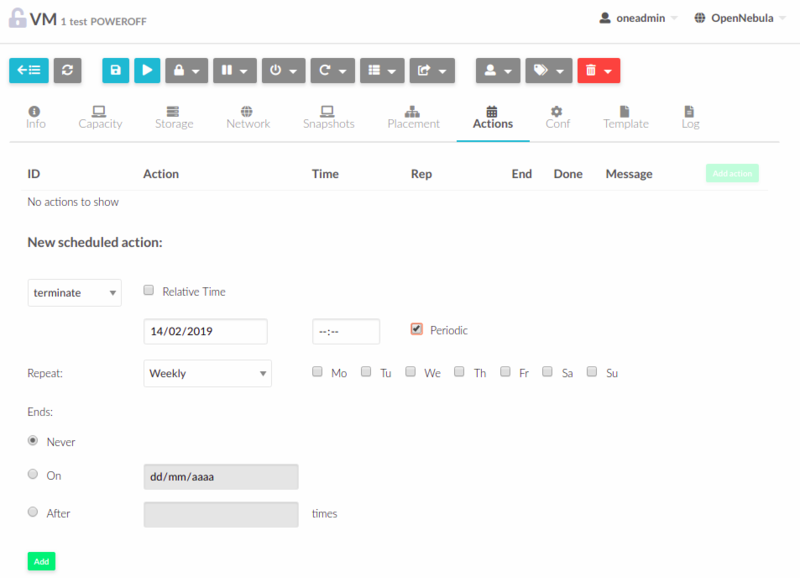 To schedule periodic actions also use the option –schedule. However this command also needs more options to define the periodicity of the action. --weekly: defines a weekly periodicity, so, the action will be execute all weeks, the days that the user defines. --monthly: defines a monthly periodicity, so, the action will be execute all months, the days that the user defines. --yearly: defines a yearly periodicity, so, the action will be execute all year, the days that the user defines. --hourly: defines a hourly periodicity, so, the action will be execute each ‘x’ hours. --end: defines when you want that the relative action finishes. The option --weekly, --monthly and --yearly need the number of the days that the users wants execute the action. Number: defines the number of repetitions. Date: defines the date that the user wants to finished the action. $ onevm snapshot-create 0 --schedule "09/23" --hourly 10 --end "12/25"
Scheduled actions can be also relative to the Start Time of the VM. That is, it can be set on a VM Template, and apply to the number of seconds after the VM is instantiated. For instance, a VM Template with the following SCHED_ACTION will spawn VMs that will automatically shutdown after 1 hour of being instantiated. Custom attributes can be added to a VM to store metadata related to this specific VM instance. To add custom attributes simply use the onevm update command. Administrators can also change the VM’s group and owner with the chgrp and chown commands. resched: Sets the reschedule flag for the VM. The Scheduler will migrate (or migrate –live, depending on the Scheduler configuration) the VM in the next monitorization cycle to a Host that better matches the requirements and rank restrictions. Read more in the Scheduler documentation. unresched: Clears the reschedule flag for the VM, canceling the rescheduling operation. deploy: Starts an existing VM in a specific Host. migrate --live: The Virtual Machine is transferred between Hosts with no noticeable downtime. This action requires a shared file system storage. migrate: The VM gets stopped and resumed in the target host. In an infrastructure with multiple system datastores, the VM storage can be also migrated (the datastore id can be specified). Note: By default, the above operations do not check the target host capacity. You can use the --enforce option to be sure that the host capacity is not overcommitted. recover: If the VM is stuck in any other state (or the boot operation does not work), you can recover the VM with the following options. Read the Virtual Machine Failures guide for more information. --retry: retries to perform the current driver action. Optionally the --interactive can be combined if its a Transfer Manager problem. migrate or resched: A VM in the UNKNOWN state can be booted in a different host manually (migrate) or automatically by the scheduler (resched). This action must be performed only if the storage is shared, or manually transfered by the administrator. OpenNebula will not perform any action on the storage for this migration. The Sunstone documentation contains a section on VNC troubleshooting. 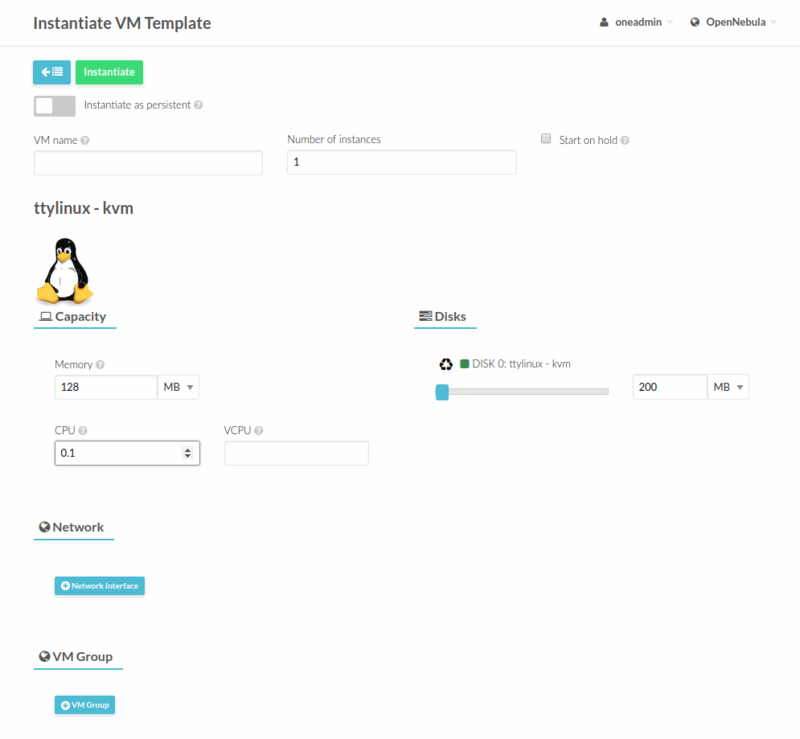 Although the default way to create a VM instance is to register a Template and then instantiate it, VMs can be created directly from a template file using the onevm create command. When a VM reaches the done state, it disappears from the onevm list output, but the VM is still in the database and can be retrieved with the onevm show command. 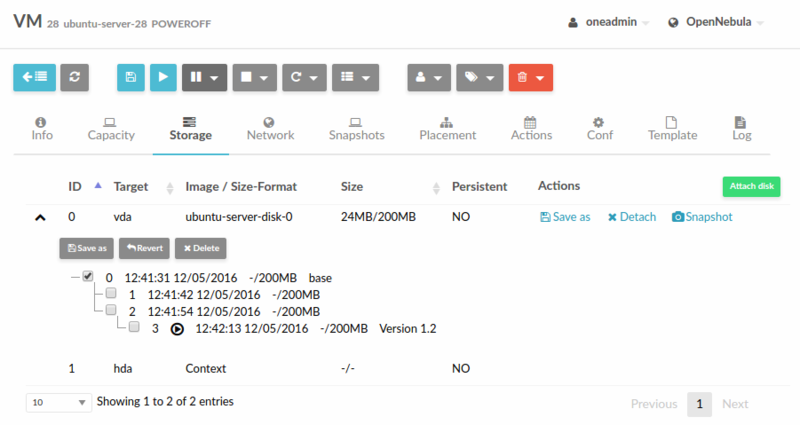 OpenNebula comes with an accounting tool that reports resource usage data. 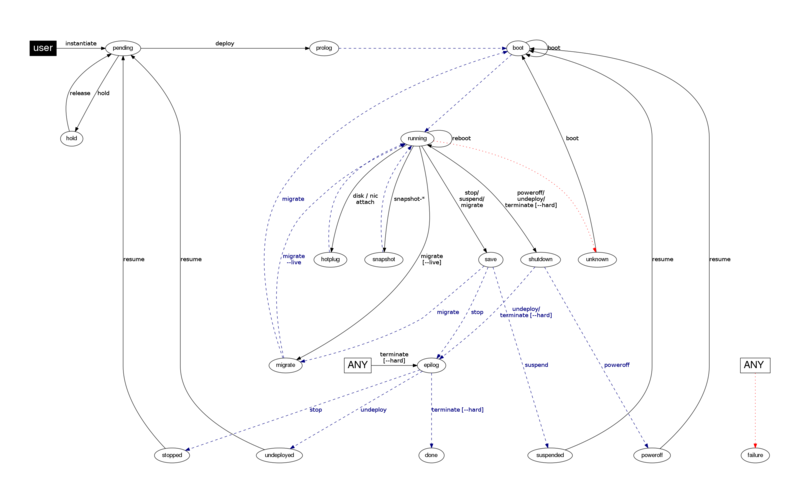 The monitoring information, shown with nice graphs in Sunstone, can be retrieved using the XML-RPC methods one.vm.monitoring and one.vmpool.monitoring.